The streets and yards are lined with all the colors of fall: gold, rust, brown and a few recalcitrant green leaves. As our appetite changes with the season, we need something to fill the kitchen with the tempting aromas that make us salivate in anticipation of the next meal, and nothing does that better than a bowl of soup. 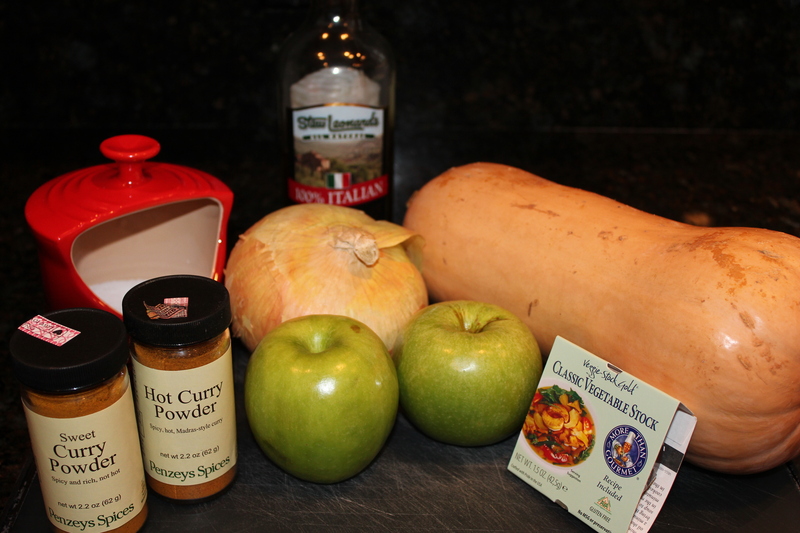 This recipe for Curried Butternut Squash Soup has few ingredients: curry, butternut squash, Granny Smith apples, onions, vegetable stock, olive oil and Kosher salt. It’s perfect for all dietary needs — it’s vegan, dairy free and gluten free. 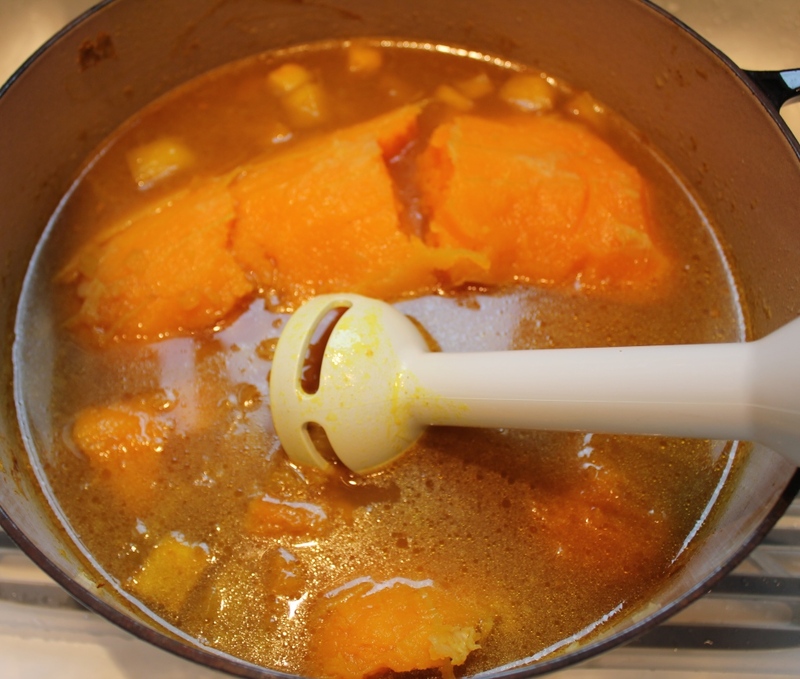 For this recipe, the squash can either be peeled, seeded, cubed (the smaller the cubes, the faster the cooking time) and added directly to the soup mixture for cooking; or roasted and the flesh scooped out at the end of the cooking. Either method works well, there is no difference in taste, texture or appearance. See these helpful posts for How To: Peel a Butternut Squash and How To: Roast a Butternut Squash. 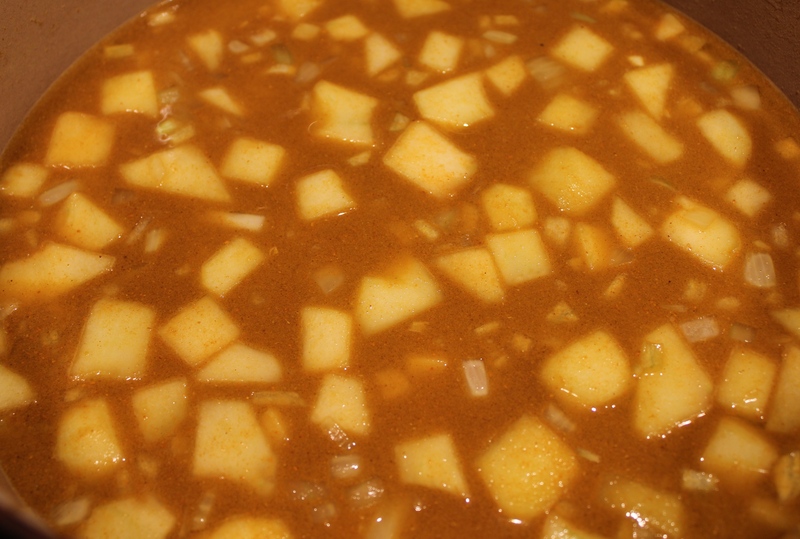 Butternut squash, Granny Smith apple, onion, olive oil, curry, salt and vegetable stock. I’m showing hot curry here for those whose palettes are not as delicate (okay, wimpy) as mine. 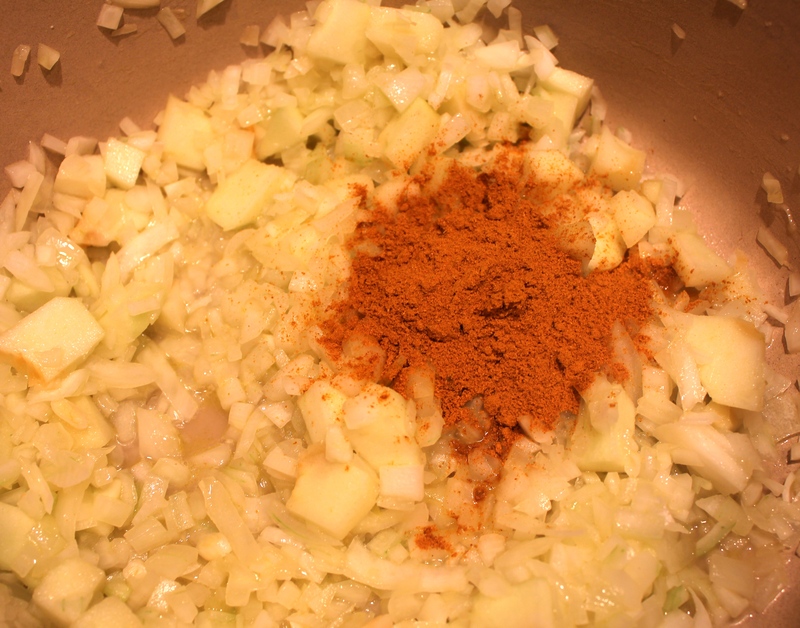 If you decide to use the hot curry, halve the amount to one teaspoon. Also, for those really paying attention, I made a double batch, which is why the onion is HUGE and there are two apples. That’s a five-pound squash! I have tested the recipe for a single batch and it works great. I wanted to get a big batch made and frozen for the holiday season. It really comes in handy. Last year I served a small mug of the soup to everyone as they arrived for X-mas eve dinner. Heat the olive oil in a large covered pot over medium-high heat. 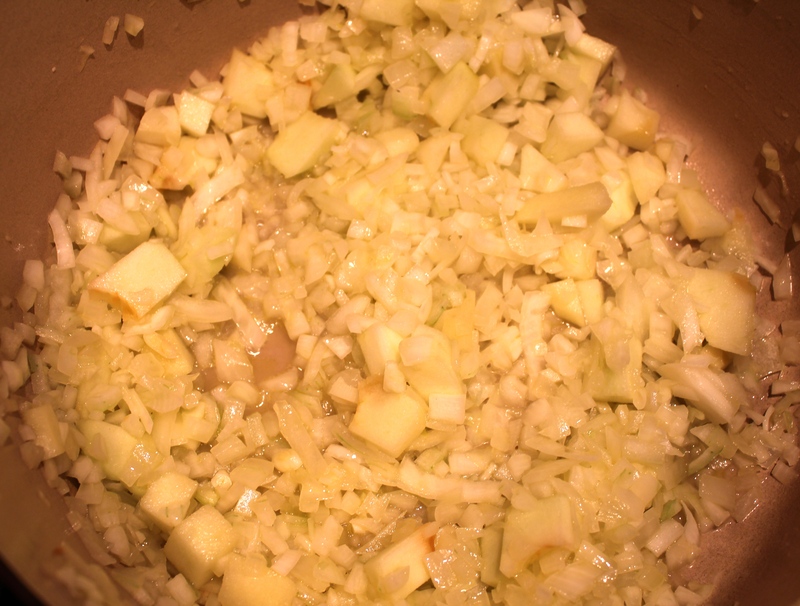 Lower the heat a little, toss in the onion, apple and salt and cover and sweat for five minutes, which releases water and softens the onion and apple. Stir the curry powder into the hot vegetables and oil and stir for about 30 seconds, which releases the natural oils in the spice. Add the stock and squash (either raw or roasted) and bring to a boil. Lower the heat to a gentle boil and cook until the apple and squash are easily crushed when pushed against the side of the pan with a wooden spoon. This can take anywhere about 45 minutes depending on the size of the squash pieces. 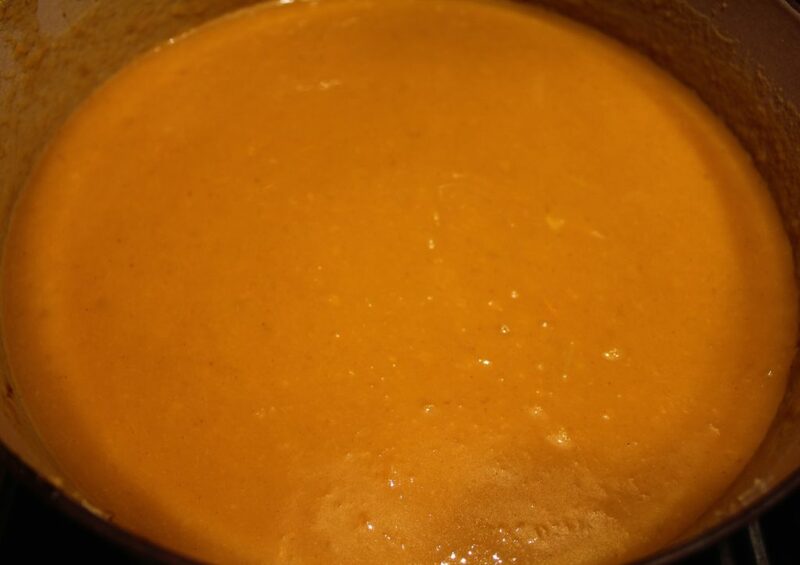 Puree the soup with a blender, in batches, or with an immersion blender. See out video on how to safely blend hot ingredients. It’s always a good idea to taste at this point and tweak to your liking. Enough salt? Too thick? Add some water. Too spicy, add a squeeze of lemon juice. More Than You Need Now? Freezes well for several months. For this recipe, the squash can either be peeled, seeded, cubed (the smaller the cubes, the faster the cooking time) and added directly to the soup mixture for cooking; or roasted and the flesh scooped out at the end of the cooking. Either method works well, there is no difference in taste, texture or appearance. 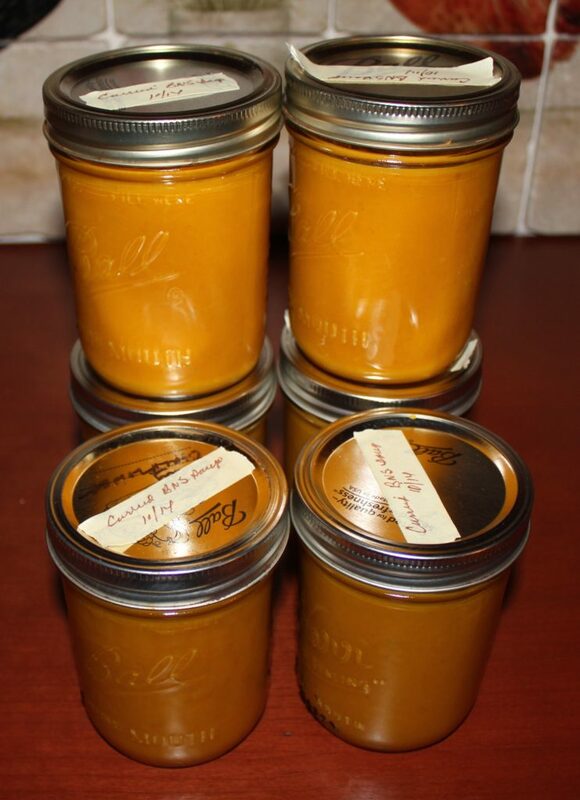 Check out the website to see How To: Peel a Butternut Squash and How To: Roast a Butternut Squash. Line a 10” x 15” baking sheet with parchment or foil. Heat the oil in a large covered pot over medium-high heat and stir in the onion, apple and salt; cover, lower the heat and sweat for five minutes. Add the curry and stir for 30 seconds to release the flavor. Stir in the stock (and raw squash, if using this method) and bring to a boil, lower the heat to a gentle boil and continue cooking until the squash easily crushes against the side of the pan, approximately 30-60 minutes, depending on the size of the squash cubes. Puree the soup (add the roasted squash at this point if using that method) in a blender, in batches, or with an immersion blender. Taste and adjust seasonings as needed.